How Much Does A Balustrade Cost? 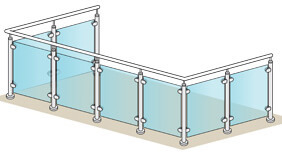 Installing a Glass, Stainless Steel Wire Balustrade or Juliet Balcony is not as expensive as you may think, with forward planning and help from our technical team you can achieve the balustrade that is just right for you. We have put together some examples of our most popular balustrade and Juliet balcony systems in a selection of layouts to give you a better idea of the costing. Frameless glass offers a contemporary solution that won't make your space feel claustrophobic, and almost emphasises the view rather than screening it as some other balustrade materials do. 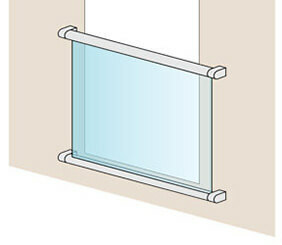 These systems are available in different mounting positions: Top, Fascia, 'F' and 'Y' mount. The costs below are based on a Top Mount solution. Glass channel uses a safety wedge and insert system which allows for glass panel adjustment in every direction for perfect glass alignment every time. 4 metre straight run Easy Glass Prime Balustrade for outdoor use, based on 21.52mm toughened and laminated glass thickness with top mounted base profiles. 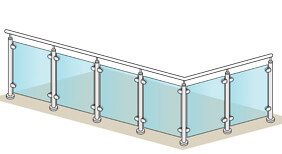 4 x 2 metre 'L' shape Easy Glass Prime Balustrade for outdoor use, based on 21.52mm toughened and laminated glass thickness with top mounted base profiles. 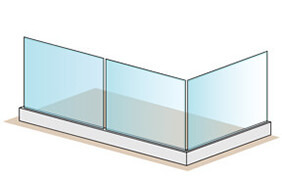 2 x 4 x 2 metre 'U' shape Easy Glass Prime Balustrade for outdoor use, based on 21.52mm toughened and laminated glass thickness with top mounted base profiles. 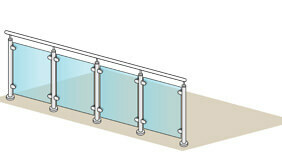 Glass balustrade combined with modular stainless steel posts and handrail. strong and hard wearing balustrade system. Uses glass clamps to secure glass infill in place. 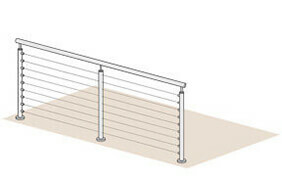 Extensive range of handrail components for the most demanding of balustrade layouts. When combined with the relevant fixings this system is perfectly suited for installation on to masonry, concrete and timber decking surfaces. 4 metre straight run for outdoor use, based on 10mm toughened glass thickness, model 22 glass clamps, 42.4mm posts with all components in 316 grade stainless steel. 4 x 2 metre 'L' shape for outdoor use, based on 10mm toughened glass thickness, model 22 glass clamps, 42.4mm posts with all components in 316 grade stainless steel. 2 x 4 x 2 metre 'U' shape for outdoor use, based on 10mm toughened glass thickness, model 22 glass clamps, 42.4mm posts with all components in 316 grade stainless steel. Stainless steel wire balustrade is a great way to achieve a strong and secure balustrade that provides maximum safety without spoiling the view. 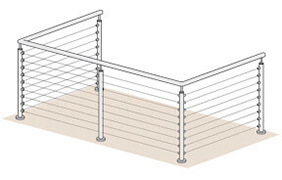 Available in tubular or square styles, this post and handrail system uses horizontal 316 grade stainless steel wires for the infill. This style of balustrade looks great for any internal or external installation with options available for outdoor and indoor use. 4 metre straight Wire Balustrade in 42.4mm stainless steel tube with 9 balustrade wire rows at 100mm spacing, Standard height of 1100mm, 316 grade stainless steel for outdoor use. 4 x 2 metre 'L' shape Wire Balustrade in 42.4mm stainless steel tube with 9 balustrade wire rows at 100mm spacing, Standard height of 1100mm, 316 grade stainless steel for outdoor use. 2 x 4 x 2 metre 'U' shape Wire Balustrade in 42.4mm stainless steel tube with 9 balustrade wire rows at 100mm spacing, Standard height of 1100mm, 316 grade stainless steel for outdoor use. Juliet balconies are designed to sit just outside a pair of French doors or full height opening window on the upper storey of a building, giving the appearance of a full balcony. 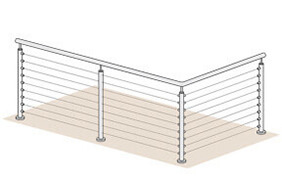 This style of balcony maximises light and air into a room while at the same time acting as a secure safety barrier. Available in a choice of Easy Glass View aluminium frame, tubular stainless steel and square stainless steel styles. 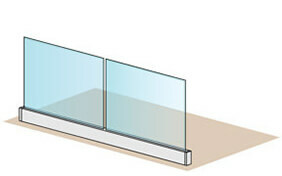 2 metre Easy Glass View Juliet Glass Balcony - Based on using 13.52mm toughened and laminated glass infill. 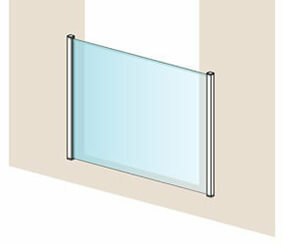 2 metre Juliet Glass Balcony - 10mm toughened glass, 42.4mm tubular profile in 316 grade stainless steel for outdoor use. 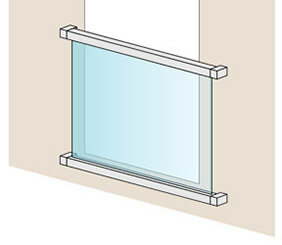 2 metre Juliet Glass Balcony - 10mm toughened glass, 40mm square profile in 316 grade stainless steel for outdoor use.